German improvisator and novelist; born at Altona July 26, 1799; died at Jena Sept. 13, 1851. He early manifested an unusual aptitude for acquiring languages, and while still in college he translated Shakespeare's "Macbeth" into German verse. In 1817 he entered the University of Berlin, where he devoted himself to the study of medicine, history, and literature, afterward settling in Hamburg, where he pursued a literary career. The success of the Italian improvisators Gianni and Spricci developed in him a desire to embrace a similar career; and in 1825 he started on his first tour, visiting Bremen, Hanover, Brunswick, Wolfenbüttel, Weimar, Leipsic, and Dresden, and meeting everywhere with marked success. Among his admirers were Goethe and Grand Duke Karl August, the latter of whom appointed him to a professorship in Weimar. 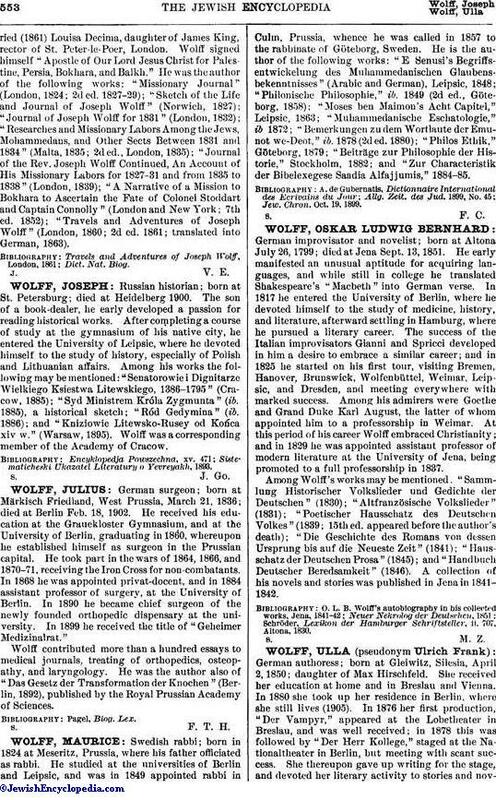 At this period of his career Wolff embraced Christianity; and in 1829 he was appointed assistant professor of modern literature at the University of Jena, being promoted to a full professorship in 1837. Among Wolff's works may be mentioned: "Sammlung Historischer Volkslieder und Gedichte der Deutschen" (1830); "Altfranzösische Volkslieder" (1831); "Poetischer Hausschatz des Deutschen Volkes" (1839; 15th ed. appeared before the author's death); "Die Geschichte des Romans von dessen Ursprung bis auf die Neueste Zeit" (1841); "Hausschatz der Deutschen Prosa" (1845); and "Handbuch Deutscher Beredsamkeit" (1846). A collection of his novels and stories was published in Jena in 1841-1842. Schröder, Lexikon der Hamburger Schriftsteller, ii. 707, Altona, 1830.